The clue is in the name here at Catered Ski Chalets, and although our focus is on chalet holidays, we have many lovely hotels and self-catered apartments on our books. We do feel, though, that whether you choose a chalet or a hotel, the half-board catered experience is what makes a good ski holiday great. Half-board catering on a chalet or hotel ski holiday typically includes full breakfasts with hot and cold options, afternoon tea and cake, pre-dinner canapés, and 3- or 4-course dinners with wine. With housekeeping and kitchen staff on hand, you don’t need to lift a finger – and guests often find themselves making good friends with the team looking after them each week. It’s a wonderfully convivial arrangement, and leaves you plenty of time to unwind on the sofa with a glass of wine! This way, guests are free to focus on what matters: relaxing among friends and family, and getting out on the snow. Booking a catered chalet on exclusive use for your group means plenty of privacy and a chance for Alpine fun with old friends or family. 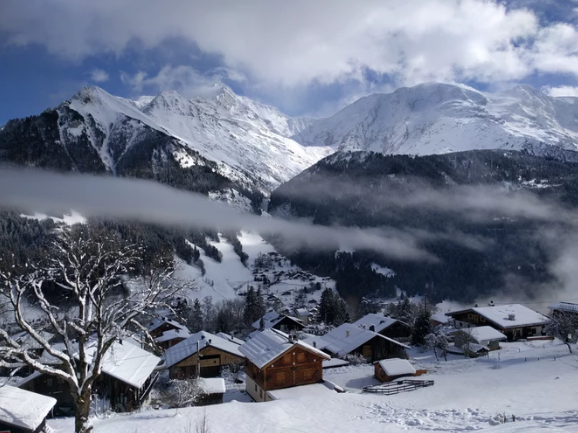 But booking a few rooms in a larger catered chalet can also be great… You get to meet new people with a shared interest in snow sports, and enjoy the mountains among new faces. Hotels, on the other hand, offer a blend. You have the choice to stick with your group or mingle with others, with perhaps a little more flexibility regarding dining times. Whether you choose a chalet or hotel, the pros and cons of going catered remain essentially the same. Staff are on hand to look after you, and help you enjoy your holiday to the full. No conversation about the benefits of going catered would be complete without mentioning the all-inclusive experience. The majority of catered ski holidays are half-board, but there are full-board exceptions to this rule. Club Med do a fine line in full-board catered holidays, as we found out in Val Thorens. It really is the last word in ski holiday simplicity, with delicious all-you-can-eat meals and unlimited drinks. The standard of food is remarkably high, but it’s the ease that draws most people to the all-inclusive catered experience. If you’re curious to know more, check out our all-inclusive ski holidays. A chance to sample local cuisine, sipping wine among friends and family with staff on hand to ensure you don’t have to lift a finger… what’s not to love?! For more details on the diverse catered ski holiday options we offer, call our friendly sales team today on 020 3080 0202. You can also get in touch via our helpful chat facility, here.